What can be better than traveling throughout the British Isles from one famous links course to another in the lap of luxury? Enjoy watching the video below which offers an inside look at our VIP Golf Coach and Concierge Driver experience. 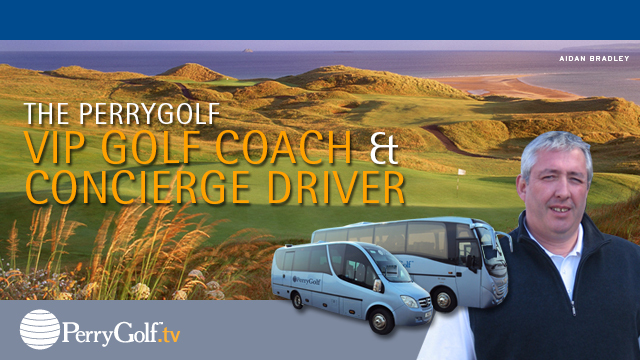 Every custom configured PerryGolf VIP Golf Coach makes it happen with the guidance of a PerryGolf Concierge Driver using vehicles suitable for 8-24 Guests. Each Coach offers individual leather seating, an electronic entertainment center, panoramic views, generous storage space for golf gear and luggage, plus the full-time services of a professional Concierge driver. Your driver will meet you upon arrival at the airport and return you to the curb for departure. During your stay, he will assist with golf bag and luggage handling, caddie arrangements, dining reservations, hotel check-ins, and of course arranging additional golf! Moreover, the VIP Golf Coach assures an equally ideal experience for groups with non-golfers who can enjoy it at their leisure for shopping and sightseeing while the golfers play.